If you’re looking to add to your vegan shoe collection, T.U.K have just made your life very simple. The popular footwear brand has brought out a new range of creepers, boots, and mary-janes. But it doesn’t stop there. San Diego based T.U.K has ensured that a large proportion of the new range is PETA approved, using vegan leather and other materials that don’t derive from animal products. The new collection will feature designs with embroidered roses and studs, and velvet features heavily across the range. 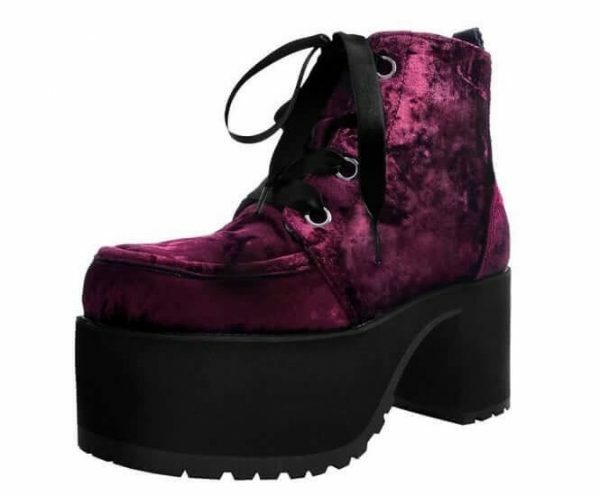 New designs such as the Burgundy Crushed Velvet Nosebleed Boot will be available along with creepers made using vegan leather. Over recent months, a new, optimistic trend for everything vegan seems to have gripped the world and shoes, it seems, are no exception. More and more designers are now choosing to bring out new cruelty-free footwear for their customers. The desire for cruelty-free footwear could be down to a new awareness of animal welfare and an understanding of where products such as leather come from. Previously it has been believed by many that leather is a by-product of the meat industry, with those who produce it doing so to use up all the parts of a slaughtered animal. However, this is not always the case, many animals are poached exclusively for the purpose of taking their skin for leather.